Preheat the oven to 150C. Line 2 baking trays with paper then draw a large circle – the size of a side plate onto each page. In a clean, medium-sized metal bowl, beat the egg whites with a clean whisk until the whites form soft peaks. While the beating, slowly sprinkle in the sugar then continue whisking until stiff peaks form – the mixture should be glossy. Whisk in the vinegar and corn flour. Divide the mixture between the two trays then spread evenly to form two circles, using your template as a guide. 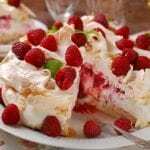 Place meringues into the oven, then turn the oven temperature down to 120C. Bake meringues for 45 minutes then turn off the oven and leave meringues to cool completely. 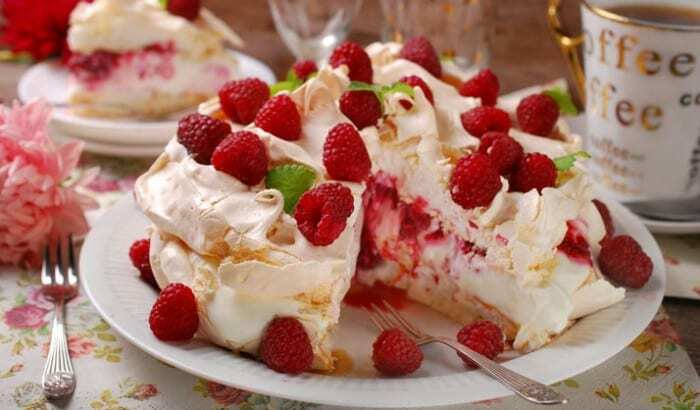 Make the filling by folding the mashed raspberries into the cream to create a ripple effect, then spoon mixture onto one of the cooled meringues. Place onto a serving plate or cake stand, then drizzle with remaining mango puree. Top with the second meringue, then garnish with fresh mangoes and raspberries and a dusting of icing snow.